We are halfway through the 2018-2019 school year! The holiday season is full of celebration and reflection, both as we take stock of the work we’ve accomplished and set resolutions for the new semester of school that will begin in January. Projects are a lot of work. There, we said it. There’s no denying it! Whether we are looking to build a garden, host a holiday celebration, or start a new workout regimen, projects require advanced planning, more effort and energy than our daily routine, and acquisition of knowledge, skills and supplies. As an organization, we’ve learned that because PBL projects require a lot of work, we need to look at them a little differently than we have in the past. Instead of choosing standards that are less central to a discipline, focusing a project on social emotional outcomes above academic outcomes, or choosing too many standards, we are learning that it’s best to focus on 1-2 very high leverage standards for which we can provide the students lots of time and opportunity to understand and practice from multiple angles, at multiple depths, and in real-world settings where they have to apply their knowledge. We know these opportunities to practice in real-world scenarios and with public audiences will help students develop those social & emotional skills, and we can even design for that. But if we are going to break our routine and tackle a project, then we really want to make sure that the academic focus of the project is worthwhile. Just as we trained teachers, we also know that building the capacity of administrators to support Project Based Learning work is essential. At the end of last year, we asked how we could make our learning visible, from students to teachers to administrators. Our principals are thinking about this through their 2018-2019 PBL Leadership Series, involving teachers and community in their thinking and developing action plans for their sites. At Bancroft Middle School, Principal Valentin Del Rio engaged his staff in work to have one anchor project at each grade level that multiple departments will support and that all students will experience. His theory is that cross-departmental discussion about focus standards and skills will enable all teachers to support projects in each of their classes. In order to meet the district’s strategic goal of having each student experience two projects per year, Bancroft teachers are deciding on those projects, and identifying ways that each can teach specific skills. Principal Jeannette McNeil and the teachers of Monroe Elementary will be hosting a PBL Expo on January 16th from 8:15-9:15am so that families and the greater community can tour the school and provide feedback to students about their projects. Principal McNeil’s theory of action is that sharing our practice, engaging teachers and students as learners, and bringing the community’s participation into the process will enhance the students’ learning. At the end of this past school year, teachers shared that a bank of high quality projects would go a long way to helping them understand PBL methodology. 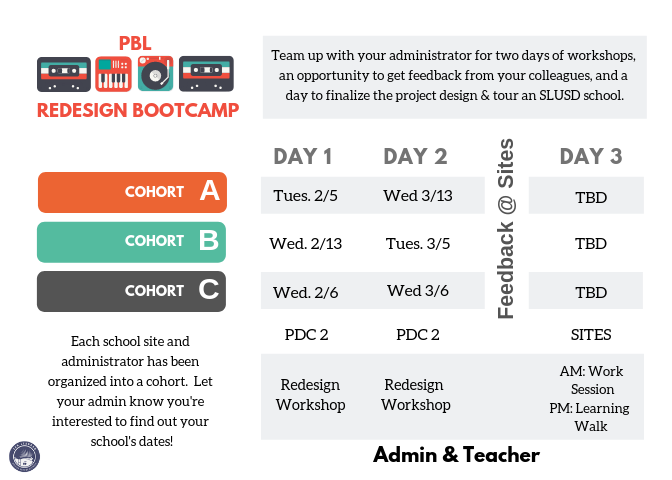 As a result, we are hosting a PBL Redesign Bootcamp in the late Winter / early Spring! Teachers and Principals will team up to take a project a teacher’s designed and re-design it with a lens for English Learners. San Leandro Unified advocates for the success of our multilingual learners, and knows that a focus on language development benefits everyone. Our redesign partnerships will have the additional focus on high leverage academic standards, inclusion of student artifacts, and alignment of projects with SLUSD literacy programs and resources. Not only will we develop a bank of high quality projects for teachers across the district, we will also build capacity across our organization in supporting language learners. The model for the SLUSD Redesign Bootcamp. One of our continuing goals, as always, is to help our teachers in SLUSD align PBL with high stakes assessments, to support student social and emotional development, and to provide intervention and enrichment to a diverse group of learners. Creating coherence for students and teachers, to see how all of the pieces fit together, is high on our list of priorities to find answers to, and know that we will require the brains of all of our stakeholders to figure this out. This past Spring, San Leandro Unified published its Graduate Profile, a document truly developed by the entire community, that outlines the skills and qualities of the ideal graduate of our schools. We can call it the North Star of our educational system. It carries the principles that will guide our work, and is the promise our school district makes to our students and community - it's what we promise to do for you. So what does the graduate profile mean for Project Based Learning? Well, Project Based Learning aims to develop both academic skills and those less tangible assets we want our students to develop. For example, we want students to think critically, and we also want them to develop the flexibility to collaborate with people who have diverse perspectives. We left the 2017-2018 school year wondering what the signs are that tell us that students are learning. Other than listening and looking for markers like use of academic terms or demonstration of specific skills, we didn't have the language to name the other competencies we were looking for. The graduate profile fills this gap. It provides us all with the goals we can work towards and the language we can use to identify it when we see it. It also allows our teachers to more strategically design their teaching and learning experiences to build towards these outcomes. Let's look at an example. San Leandro High School Physics teacher Nick Sigmon kicked off the 2018-2019 school year with a project focused on concussions. It's a physics project that allows students to learn about force, impact, and motion through the real-world context of football, head injuries, and safety. In this project, students develop and test designs for a football helmet that can reduce the amount of force and motion that impacts a person's head upon contact. The video here shows some of the teaching practices and learning experiences involved in the project. As you watch, see if you can identify some of the traits of our ideal graduate being developed through the project. A teacher designing, planning and managing activities linked to standards, and creating opportunities for sustained inquiry. Students are collaboratively constructing knowledge in the room with the support of the teacher; students are able to teach each other, and it's all done in a real-world context. Ultimately, the learning the student do transcends the classroom space, and prepares them for life beyond our high school community. SLUSD's Graduate Profile and Project Based learning work hand in hand; it's a tool that allows us to more intelligently design with the end in mind. But just as students’ work leads them to more complex questions in a PBL project, our own aims to have each student experience two high quality projects per year have led to inquiries that are more difficult to answer. They focus on the art of teaching, the methods, and systems we can use to ensure deeper learning for our students. So to round out our year, we’ll share initial answers to this driving question: How can a school district transform the teaching and learning of over 9000 students across 9 schools, grades TK-12? We'll also share some of the new questions that will drive our learning in 2018-2019. Press on an answer below to read more about that concept, or scroll through! ​Making our thinking and work process visible shifts us to a culture of learning. ​PBL is a strong method for student learning. In order to for us to find success, we needed everyone to be part of this journey. That meant we needed to find a way to provide all stakeholders with a doorway into Project Based Learning. We trained all of our teachers, but quickly learned that we needed to begin customizing and expanding our training about PBL to more groups. We created customized PBL 101 and sustained support 201 workshops based on grade level and subject area, and are developing specialized 1-day trainings for PE teachers and teachers of mild-moderate and moderate-severe special education classes. We've conducted workshops for principals throughout the course of the year focused on organization, instruction and management of schools, and have worked with parent facilitators to teach them about Project Based Learning so that they can support families at their school sites. Not all will be teaching Project Based Learning in a classroom, but all need to know about its core concepts and strategies, and how they can support it through the work they do. ​We talked earlier in the first blog post about sharing our ideas with others as a means of improving them. Over and over again we noticed a pattern emerging. Principals were pleasantly surprised by the effective teaching practices being used in classrooms, only because they have very few opportunities to walk through classrooms. The same occurred with teachers, who had opportunities to visit each other's classrooms this year. By seeing each other in action, we remove the assumptions and stories we develop, and find actual evidence of success. We deepen our knowledge of the subject we're learning, helping us see the value in continued professional learning, and just as important, helps strengthen our personal culture as well. The vulnerability we exhibit when sharing our practice helps make connections, develop authentic relationships and excitement, and creates investment. Sharing our practice has strengthened us as an organization, and has validated that we are all on this journey together. In addition to teachers and principals, the families of SLUSD love seeing the work that is happening in classrooms. We can hear the value of true engagement and participation from the family members of a student in Melissa Valdivia's classroom at Roosevelt Elementary school. How can we bring the public into and through our projects? How do we make our learning visible, from students to teachers to administrators? Some schools found that school-wide projects and experiences that were highly visible created anticipation and excitement for investing more deeply in the work. For example, when Monroe Elementary 4th grade teacher Michelle Henry-Ellis invited the whole school to participate in her project centered on the school garden, more teachers wanted to get involved and develop their own school garden projects. At the same school, Principal Jeannette McNeil invited the community to a schoolwide PBL exhibition to provide feedback on student work for projects that were still in motion. Families, students and teachers loved seeing and supporting the work of the other classrooms. their reflections about a project that centered on designing dog sleds in connection with Akiak, a fictional tale about an injured dog in the Iditarod. The students not only show knowledge about the anchor text and the science content, but also illustrate awareness about how they solve problems, how to speak effectively, and how to reflect. Ms. Jimenez also scaffolds this thinking through her probing questions in the whole class reflection. 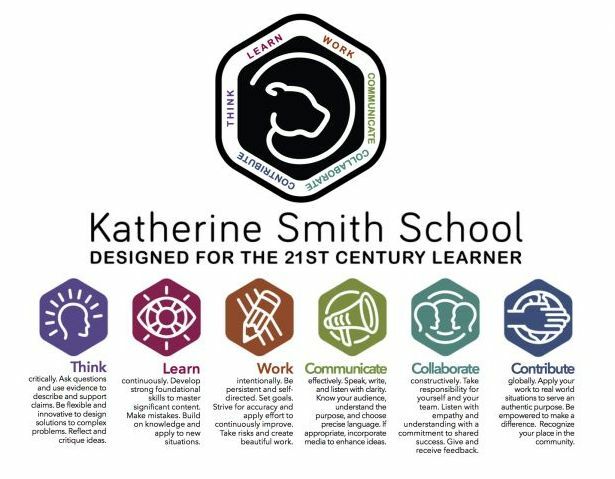 PBL provides opportunities for achieving skills and concepts outlined in standards, and also for developing 21st century success skills. What are the indicators for student learning we can use to assess mastery? How do we integrate PBL in and throughout our new ELA/ELD Programs? How can principals help support the planning and design of high quality PBL projects? San Leandro Unified School District is proud of the work we've done this year, and thanks all of the teachers, principals, families, and students for their hard work! We look forward to 2018-2019, to finding new answers and new questions! All this talk about Project Based Learning, but what does it look like in action? In this post, we're spotlighting "Diggin Up Dinos," teacher Olivia Emerson's 2nd grade project at Madison Elementary. Instead of writing about the project, we'll let the work speak for itself. As you watch, think about how this experience, both for the teacher and the students, is different from a traditional class project. The project looks great! And we had to ask, what are our students learning? Again, we want the students to speak for themselves, so as you watch, notice the students' understanding of the project, their knowledge of the process, their mastery of academic language and content, and their ideas about what matters for their learning. Pretty amazing, right? We think so. In a nutshell, Project Based Learning replicates how we learn as people: some event acts as a spark plug, causing us to ask a question, which sets us on a path to learn. Along the way we share our learning with our peers, and as we dialogue, read, watch videos, or study artifacts, our learning deepens. In professional settings, our learning culminates in a product we create, whether it be a presentation, a model, or a report. Usually, we can't do this without partners. After all, humans are social beings - and we do better when we share. Here's a concrete example: in the moments following an important societal event - whether it be the newest episode of your favorite show, or a crazy political incident, what is the first you do? You turn to talk to someone about it. You process it. You share your view and hear the view of another person. You go to learn more, you think, and the cycle repeats. That's learning in a nutshell; so it's perfect that teachers -our learning professionals- are doing the same. Originally I believed I had all the pieces... but after the protocol, the pieces fit together like a jigsaw puzzle. Enter the protocol. As our teachers are learning how to design high quality PBL experiences, they're using protocols, which are structured conversations that allow them to share and receive feedback on their current work in progress. Exactly how we usually learn. But good learning takes time, and our first ideas are great ideas in the making, so they require time and attention. The protocol allows multiple participants their own time and attention to process ideas. And in a time when it seems like everyone is just yelling at each other, collaborating with protocols is paying off. What stands out about his experience is how he was able to make sense out of his ideas just by sharing and listening. He was no longer alone in this work, and the protocol he was referring to took only 15 minutes. In that time he was able to move through multiple phases of learning to make sense of his project idea. No instructor stood in front of him telling him how to fix his project. No one gave him a formula he needed to follow. Yet he learned deeply, from and with his peers, in a way that's very normal for us to learn - through conversation. It was only through telling his story in this way that he was able to see what was missing. So what does this mean for our teachers and our students as a whole? It means there's huge opportunity for students to learn like this as well: to be engaged in conversation with peers, to learn in phases, to develop and refine their ideas over time. Protocols, while not a silver bullet, help us identify pieces that might be currently missing from the story of our teaching practice. As a component of high quality projects, protocols allow for summary, reflection, synthesis of information, and application - all higher order thinking skills beneficial for retention and deeper learning.